I read this article and found it very interesting, thought it might be something for you. The article is called What Should We Do? Delhi Govt Asks Citizens. IIT Answered 10 Months Ago and is located at https://archive.indiaspend.com/cover-story/what-should-we-do-delhi-govt-asks-citizens-iit-answered-10-months-ago-17033. 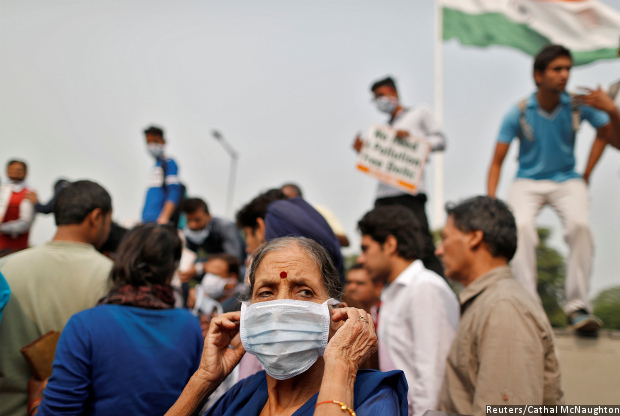 A woman wears a mask to protect herself from the pollution during a protest in Delhi. 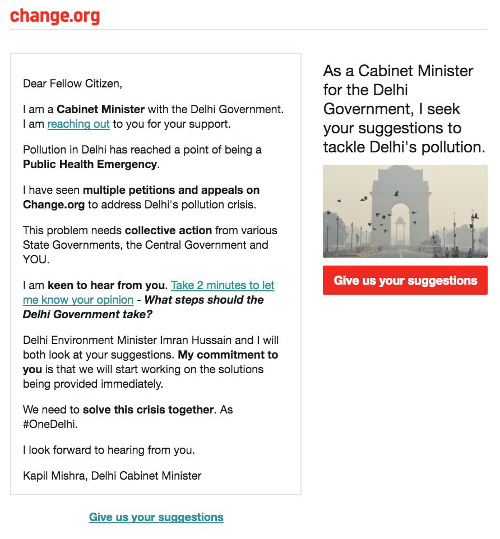 An Aam Aadmi Party minister put out a social media petition asking citizens for suggestions to check pollution following reports that Delhi is experiencing the worst smog in 17 years. On November 2 and 5, 2016, some areas in Delhi recorded a 24-hour average PM 2.5 level of over 950 µg/m³–nearly 40 times above the WHO safe levels. Ten months after the Delhi government accepted an Indian Institute of Technology (IIT) study that it had commissioned on the city’s air pollution, key recommendations remain unimplemented. Instead, a government minister has put out a social-media petition requesting suggestions from citizens. In a 334-page report, submitted to the Delhi government in January 2016, IIT Kanpur (IIT-K) recommended 28 measures over the next seven years, to contain and reduce from source various pollutants fouling the Capital’s air; 17 measures could begin immediately. The IIT report should also be useful to the Centre, which has been given two days by the Supreme Court to suggest how the air quality crisis can be addressed, according to this Mint report. If all the 28 recommendations are implemented, air quality will improve by anywhere between 30% to 100%, the study estimated. At least 19 of these 28 steps are not new to the Delhi government, found an IndiaSpend analysis of available government data sets on action taken to curb air pollution in Delhi since 2015, indicating that solutions were either ignored or not implemented. and regularly checking vehicular pollution. The study, which did not recommend a restriction on cars based on odd-even registration numbers, put forth a slew of longer-term measures to curb emissions from vehicles and industries–some of which may begin in 2017. Click here to view the action taken on the recommendations. Through the year, there was no debate and little action over the IIT-K recommendations and Delhi’s Aam Aadmi Party (AAP) government only took emergency measures–including closing down schools, shutting down a power plant, banning garden-waste burning, and banning construction activity, and diesel generators for 10 days except in hospitals and emergency situations–when the air-quality deteriorated in Delhi last week. Instead, AAP minister for water and tourism, Kapil Mishra,, put out a social media petition on November 7, 2016, on Change.org, a social-media platform. The petition came following reports that Delhi is experiencing the worst smog in 17 years, as mentioned in this Indian Express report. On November 2 and 5, the daily average levels of PM 2.5 pollutants in Delhi (fine particulate matter less than 2.5 microns in size) hovered over 700µg/m³ with some areas registering a 24-hour average of over 950µg/m³–nearly 40 times above the safe levels set by World Health Organization(WHO)–show data from our #Breathe network of sensors. PM 2.5 is about 30 times finer than a human hair and poses the greatest risk to humans. The particles can be inhaled deep into the lungs, causing heart attacks, strokes, lung cancer and respiratory diseases. Their measurement is considered to be the best indicator of the level of health risks from air pollution, according to the WHO. Delhi environment minister Imran Hussain also urged Union environment minister Anil Madhav Dave the same day for a large-scale apportionment study–identifying sources of pollution–for the national capital region (NCR), by the Central Pollution Control Board (CPCB), to design anti-air pollution measures, said this Mint report. This apportionment study, Comprehensive Study on Air Pollution and Green House Gases (GHGs) in Delhi, is–as we said–already available with the Delhi government, its details reported by IndiaSpend in October 2016. In winter, Delhi’s major sources of PM 2.5 pollutants, as identified by IIT-Kanpur, are: industries, especially thermal power plants, emitting secondary particles (25 – 30% of pollution), vehicles (20 – 25%), crop fires (17 – 26%), solid waste burning (9 – 8%), and, to a lesser extent, soil and road dust, as we reported. Our analysis of Lok Sabha (parliament’s lower house) responses and websites of the Delhi Government show that the central and state governments were already supposed to have carried out some of the measures that IIT-K suggested in its report, an indication of poor implementation. While the CPCB banned the used of coal in restaurants and hotels in December 2015, burning garbage has been banned for more than a decade under the Municipal Solid Waste Management rules of 2000. Construction dust, previously governed under the same law, is now addressed in the Construction and Demolition Waste Management Rules, 2016. Meanwhile, a 2006 Environment Impact Assessment Notification regulates pollution from building activities and concrete plants, with laws for prevention, abatement and air pollution, as this response to the Lok Sabha from December 2015 revealed. Similarly, efforts to check vehicular pollutants have been underway at Pollution Under Control (PUC) centres under a 2004 programme. Among the new measures recommended in the report, the government has yet to buy machines that can vacuum major roads and spray water to settle dust. Private contractors largely did not respond to a related tender because it clubbed sweeping with greening and beautification of roads, according to this March 2016 NDTV report. In less than one hour, his petition elicited more than 5,000 responses, said Mishra.